Solving problems is at the heart of mathematics. Mathematics evolved to solve problems of everyday life and has developed to solve many more. The mathematical thinking that supports problem-solving is the quality valued in those who have studied mathematics beyond GCSE. It is also why it is a significant part of the 9 to 1 GCSE. So what qualities in our students are beneficial when it comes to solving problems? I suggest that they are independence, creativity, being able to reason and persevering in the face of setbacks. These qualities then enable students to make connections between topics, to have ideas and to further their own learning: skills that, in turn, also support problem-solving. Many students are not accustomed to working in ways where their independence and creativity are welcomed and many of their teachers resist developing those traits, albeit unaware that this is what they are doing. There is a journey to undertake. First, recognise that the tasks you present and the support you give will be different at the start of the journey from what you will offer later. Second, realise that these qualities are best developed gradually and not all at once. You are aiming to change the culture of the classroom and this is best done by maintaining the trust and confidence of your students. Third, draw out strategies and findings from the students to create a “class toolkit”. You can contribute to this as teacher, after the students have worked on a problem, by presenting “another way to look at it is...”. So, to begin the journey, we need to show students that there is more than one way to tackle a problem and more than one answer – and that they can be successful at finding them. Puzzles are good for this as students are less likely to assume that there is a way that they are “supposed” to do it. One I have used many times is illustrated in the diagram below. Some versions of this problem state the total for each side (9, 10, 11 and 12 all work) but I think the version described here works better, with the class gradually realising that there is more than one answer. There is also purpose in trying to find totals of 8 and 13 and justifying why they don’t work. Present the puzzle on the board to the whole class – not as a worksheet. A worksheet is a call to action rather than thinking – students are more likely to think if work is presented from the board. Some may start to draw the circles immediately, others may spend much longer before doing so. The availability of mini-whiteboards is important as students can try for a solution without leaving any traces if it is wrong. Writing the numbers on counters/pieces of paper and physically moving them about can also help. 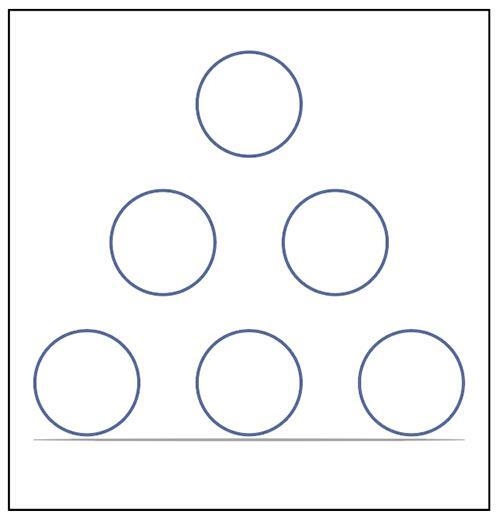 Having to copy the circles enables students to start on the problem without feeling pressure to have begun to solve it. It is a small problem so some students could do it in their heads – it is important to allow them to do that. Changing the culture of the classroom takes time and trying to accelerate it by forcing behaviours like recording are counter-productive. Students (almost) always start recording when they need to do so and subsequent tasks will make it necessary – be patient, play the long game! The task is also presented visually and requires little mathematical knowledge so students can use their working memory for thinking about solving the problem. Students develop independence here by discussing with each other, rather than asking the teacher and checking their own answers. You encourage this by responding or intervening, but only when necessary and by asking generic questions such as “what have you tried so far?”, “have you used each of the numbers from 1 to 6?”, “what does each side add to?”. This is usually enough to move them on, especially if you leave a pause after the question as this gives thinking time and the idea that it is their “move” next. Decisions about what to do at each step involve a mixture of creativity and reasoning, well within the capabilities of students. It has been suggested that students are particularly poor at reasoning in mathematics. That may be because mathematics has been presented as a series of methods with no inter-connected structure to make sense of what has been learnt, and so reason with it. Listen carefully to students talking as they work on this task – you may be surprised at the reasoning that is happening. Getting stuck is expected in this task; students are unlikely to pick a correct arrangement first time, and ways out, such as moving or swapping numbers, are easy enough to spot. Are there other ways to make 27? What other numbers can be made by adding two consecutive integers? Or three consecutive integers? Can you make any number that way? What numbers are made with consecutive sums starting with 1? Allow students to use a given research question or come up with their own. Remember it is a journey and some students will be more confident at doing this than others. They are developing creativity and independence through trying and seeing you, the teacher, modelling what sort of questions to pursue. Working out the sums emphasises the need for accuracy and of keeping track of what has been done so the need for recording comes naturally as part of the task. At some point students will make a statement such as “two numbers in the sum always makes odd numbers”. That is the point at which you challenge them to “prove it” or “show me how you know that”. Reasoning comes in here as they try to do that. Value explanations and justifications that are pictorial or wordy; algebraic proofs are not the only way to do this as the argument is the key thing here. At some point, following extended work on one or more research questions, you may wish to demonstrate the power of letting the first number be n and working with generalised (algebraic) consecutive sums. This also tackles a type of proof required at GCSE. There are many more wonderful tasks and problems for your students to work on. Hopefully the ones above will give you, and them, a place to start. Heather Davis spent 30 years in the classroom including 14 as a head of department. She is a member of the Association of Teachers of Mathematics General Council.